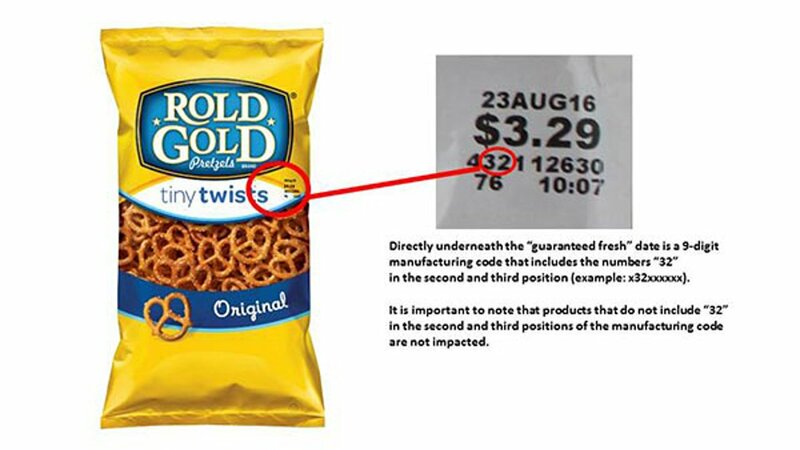 PLANO, TX -- Frito-Lay has announced a voluntary recall of select varieties of Rold Gold pretzels because they may contain undeclared peanut residue. According to a press release, the impacted products include Rold Gold Tiny Twists, Rold Gold Original Pretzel Thins, Rold Gold Sticks and Rold Gold Honey Wheat Braided Twists. The affected packages have "guaranteed fresh" dates of June 28, 2016 - August 23, 2016. The "guaranteed fresh" date is located on the front of the package. The numbers 32 will be found in the second and third positions of the numbers located below the date and price. Any product without the numbers 32 is not impacted. For complete information on the recall, visit the FDA website.